Dysthymia or chronic depression is a common symptom of codependency; however, many codependents aren’t aware that they’re depressed. Because the symptoms are mild, most people with chronic depression wait ten years before seeking treatment. Dysthymia doesn’t usually impair daily functioning, but it can make life feel empty and joyless. In the Shadow Sufferers have a diminished capacity to experience pleasure and may withdraw from stressful or challenging activities. Their emotions are dulled, though they may feel sad or melancholy or be irritable and anger easily. Unlike with major depression, they’re not incapacitated, yet they may have difficulty trying new things, socializing, and advancing in their career. Some may believe that their lack of drive and negative mood is part of their personality, rather than that they have an illness. Like codependency, dysthymia causes changes in thinking, feelings, behavior, and physical well-being. The symptoms must create significant distress or impairment in social, occupational, educational or other important areas of functioning. Although mood remains persistently “down,” it may improve for several weeks of feeling better. Untreated, depression soon returns for longer periods. People are usually motivated to seek help in order to cope with a relationship or work problem or a major loss that triggers more intense symptoms. When they rise to the level of major depression, which can often occur in people with dysthymia (persistent depressive disorder), the diagnosis is “double depression” – major depression on top of dysthymia. Unlike chronic depression, an episode of major depression may only last a few weeks, but it makes a subsequent episode more likely. The persistent depressive disorder affects approximately 5.4 percent of the U.S. population age 18 and older. The numbers may be much higher, since it often goes undiagnosed and untreated. 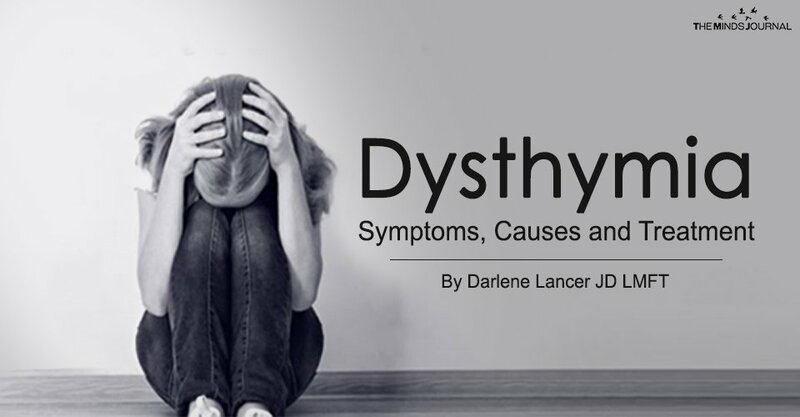 Over half of dysthymic patients have a chronic illness or another psychological diagnosis, such as anxiety or drug or alcohol addiction. 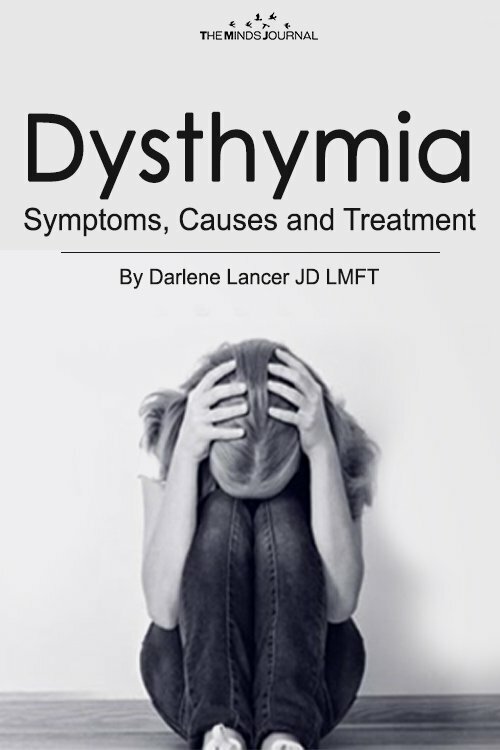 Dysthymia is more common in women (as is major depression) and after divorce. There may not be an identifiable trigger; however, in cases of onset in childhood or adolescence, research suggests that there is a genetic component. Although stress can be a factor in depression, some people don’t experience a life event that triggered their depression. There are individuals with chronic depression who blame their mood on their relationship or work, not realizing that their outer circumstances are only exacerbating an internal problem. For example, they may believe that they will feel fine when they achieve a goal or when a loved one changes or returns their love. They’re unaware that the real cause is that they’re striving to prove themselves to compensate for feeling inadequate, or that they have no life of their own, have sacrificed self-care for someone else, or that they feel unlovable and worthy of love. They don’t realize that their depression and emptiness stem from their childhood and codependency. Codependents, by nature of their addiction to people, substances, or compulsive processes, lose touch with their innate self. This drains their vitality and over time is a source of depression. Denial, the hallmark of addiction, can also lead to depression. Codependents deny their feelings and needs. They also deny problems and abuse and try to control things that they can’t, which add to feelings of hopelessness about their life circumstances. Other codependent symptoms, such as shame, intimacy issues, and lack of assertiveness contribute to chronic depression. Internalized shame from abuse or emotional abandonment in childhood causes low self-esteem and can lead to depression. Untreated, codependency worsens over time, and feelings of hopelessness and despair deepen. Codependency and depression can be caused by growing up in a dysfunctional family that’s marked by abuse, control, conflict, emotional abandonment, divorce, or illness. Psychotherapy is the treatment of choice. It is more effective when combined with antidepressant medication. Cognitive therapy has been shown to be effective be eliminating negative thinking to prevent recurrence of depressive symptoms. It may mean healing trauma and PTSD from prior abuse. In addition, patients need to develop better coping skills, heal the root cause, and change false shame-based beliefs that lead to feelings of inadequacy and unlovability. Goals should be to increase self-esteem and confidence, self-efficacy, assertiveness, and restructuring of dysfunctional thinking and relationship patterns. Group therapy or support groups, such as Codependents Anonymous or other Twelve-Step Program are effective adjuncts to psychotherapy. Lifestyle changes, such as exercise, maintaining healthy sleep habits, and participating in classes or group activities to overcome isolation are also ameliorative.